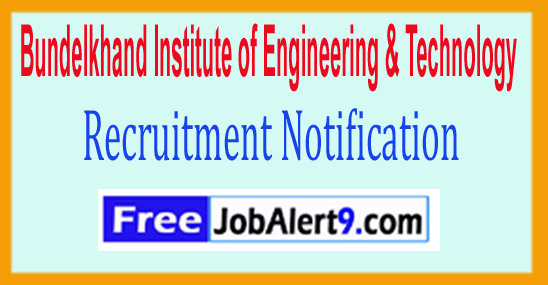 BIET (Bundelkhand Institute of Engineering & Technology) Has Released Recruitment Notification For 12 Professor, Associate Professor Posts. All Eligible & Interested Candidates Can Apply On-line . 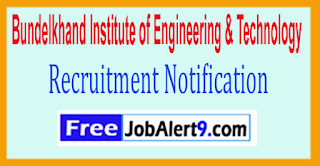 Further Detailed Information Regarding Educational Qualifications, Age Limit, Selection Procedure, Exam Pattern, Syllabus for BIET (Bundelkhand Institute of Engineering & Technology) Recruitment 2017 - 12 Professor, Associate Professor Post is mentioned below. Pay Scale - Rs. 37,400 - 67,000/- With 10,000/9000/- Grade Pay (Post 1, 2), Rs. 15,600 - 39,100/- With 6000/- Grade Pay (Post 3) . How To Apply - All Eligible and Interested candidate fill the on-line application through official web-site (http://www.bietjhs.ac.in). After successfully submitting the application, candidate must send by hard copies of application a long with relevant testimonials to the following Address before / (5th June 2017). Address -Director, Bundelkhand Institute of Engineering&Technology, Jhansi (U.P.) - 284128 . Online Registration Ends On - 05-06-2017. Closing Date for Forwarding Filled Application Forms- 15-06-2017. Click Here For BIET Recruitment 2017 Detailed Advertisement.